MoITT 3rd Year Performance: Will Slow and Steady Win the Race? MoITT 3rd Year Performance: Will Slow and Steady Win the Race. Technological intervention in human life cannot be overlooked in today’s era. It has enabled man to reach space and conquer almost every idea on logical grounds. The potential of information and communication technologies has been well recognized by almost all nations of the world and that is why from developed to underdeveloped and developing countries, technological measures have been introduced by the Governments to make use of tech advancements. In this regard Pakistan’s standing has also improved as compared to past years. Keeping in view the significance and wonders of information technology, Phone World Team always tries to come up with unbiased approach towards MoITT yearly performance analysis, hence, this year its performance evaluation is also done with great effort from available information sources. Just as last year, 2016 also proved to be a positive year in the telecom sector from many angles.The country has achieved further milestones in the field of Information and Communications Technology (ICT). 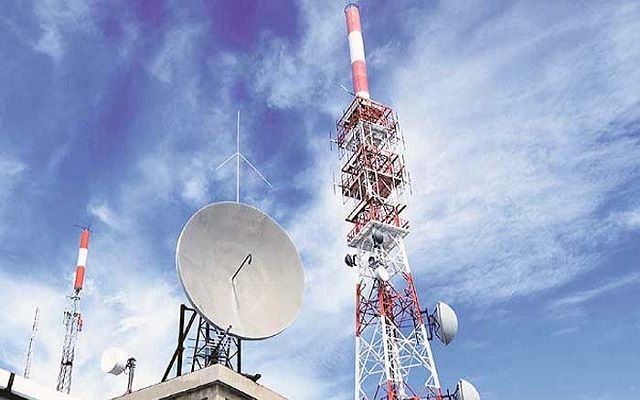 The beginning of 2016 was marked with a hallmark achievement of Ministry by finally coming up with the long awaited “Telecom Policy”, which should have come as first priority. The Ministry of Information Technology and Telecommunication (MoIT) in Jan, 2016 officially launched the “Telecommunication Policy”, after its approval by the Economic Coordination Committee (ECC). The industry overall appreciated the effort of MoITT on the issuance of the Telecom Policy document and expressed their hope that the policy will have a positive impact on the telecom sector of Pakistan. The inclusion of new areas in the policy like Mergers & Acquisition, Interference, Telecommunication Laws & Regulations (Type approval, Content and Legal Intercept), Market & Services (Competition Rules, Licensing Framework, Transfer of Business, OTT, PTCL, Cross Border P2P, Public Wi-Fi) etc. will introduce encouraging reforms in the industry. Hence, coming up with the policy is the most praise worthy effort of Ministry of the year. Another milestone achieved mainly due to the efforts of Pakistan Telecommunication Authority (PTA), is the auction of leftover spectrum of 850 MHz this year. For this purpose, based on the policy from MoITT, PTA released Information Memorandum (IM) to grant the successful bidders the right to establish, maintain and operate Next Generation Mobile Networks (NGMN) and to provide Next Generation Mobile Services (NGMS) across Pakistan. 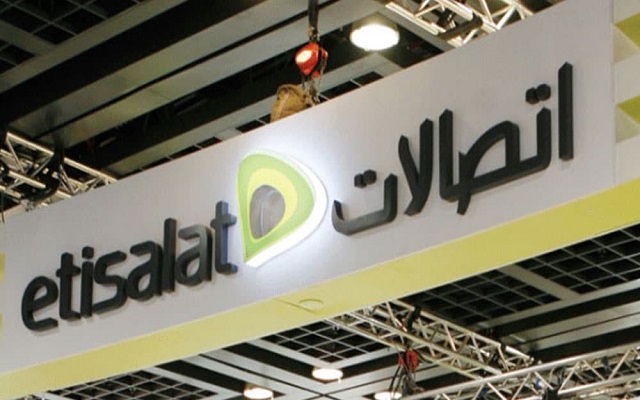 The policy had set USD 395 Million as the base price for spectrum. Telenor was the only operator that applied for the spectrum and eventually became the winner and an addition in 4G operators in Pakistan. The award of 850 MHz to Telenor by the Government of Pakistan is a success story as its transparency and fairness is recognized by the Industry as well. 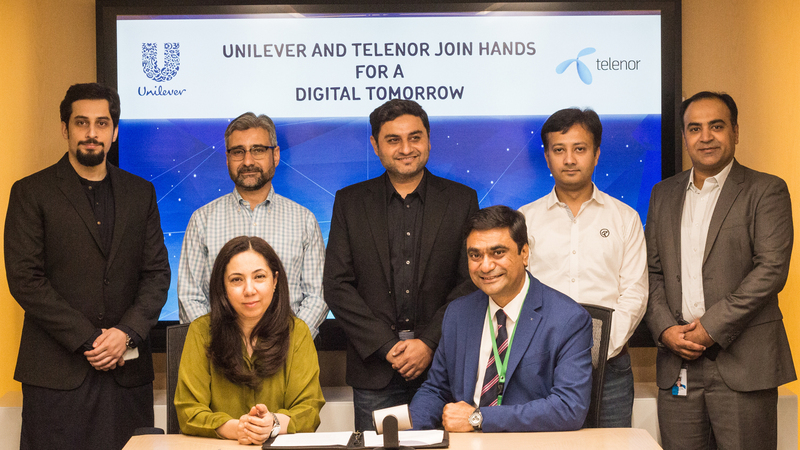 Telenor, the second largest cellular operator by subscribers also happens to have over 8 million mobile broadband subscribers, and the newly acquired spectrum will help Telenor in growing the mobile internet penetration rate in the country. Hence, conducting the spectrum auction fairly is also a praise worthy effort by the MoITT and PTA. Another achievement attained during this year was the approval of Cyber Crime Bill by the National Assembly (NA), and Senate. Cyber Crime bill was in process since 2009 i.e. almost over 7 year now and has been criticized by certain segment of the civil society citing reasons for curbing human rights and giving overreaching powers to law enforcement agencies. The fundamental criticism from civil society that stopped the cyber bill to become law from many years is that it harms the “level of freedom” of public on social media. National Assembly designated a special committee of Senate and asked civil society members to come up with amendments and suggestions. The National Assembly and then lately Senate made over 50 amendments before the Bill was finally approved by the National Assembly last month. Despite criticism, keeping in view the growing rate cyber-crimes in the country, the Cyber Crime Law is meant to provide legal cover to the development of IT sector and prevents any misuse of IT system especially for any anti state activities. This law is seen as a fundamental requirement to ensure that the Pakistan Legal system provides a system of check and balance for the smooth running of services that are based on IT system such as health, education, commerce etc. Unauthorized access to critical data, social media accounts etc. Cyber Law is meant to be used against any individual for prosecution if he commits the above mentioned crimes. According to some legal experts Cyber Crime law has the potential to become the foundation for other parts of legislations and modifications in the country as well. Keeping in view, the significance of Information Technology Industry, the MoITT has been instrumental in the announcement of extending the exemption of taxes on IT exports through the budget 2016-17. This has been very well appreciated by the IT industry and will have a very positive impact on the growth of the IT industry in Pakistan that is mainly dependent on IT Exports. The Ministry extended the date for tax exemption on IT services and products till June, 2019 for the IT companies especially for those who are in the export business. Reason being that as the IT sector in Pakistan is going through infancy stage and requires support. That is why the Government came up with the proposal to extend the exemption in taxes till June, 2019. Furthermore, IT companies — availing the tax exemption — will have to remit 80% of their revenues to Pakistan through banking channels while they can retain 20% of the revenues outside of country for meeting their expenses. This move will definitely impact the growth of IT in Pakistan in a positive way. Pakistan’s IT and Telecom growth has even been observed by the international organizations and that is why the Secretary General of International Telecommunication Union (ITU) for the first time visited Pakistan in June 2016. The efforts for such high profile visit such as ITU Secretary General is quite praiseworthy and at the same time coinciding with the visit PTA successfully organized the “ITU-PTA Asia-Pacific Regulators’ Roundtable” and the “ITU-PTA International Training Program (ITP) 2016”. These events were held from 18-22 July 2016 in Islamabad, Pakistan. This Regulators’ Round-table was the 6th consecutive time since the Asia-Pacific Region took the initiative to organize the annual Round-table to provide telecommunication/ICT regulators in the region. Such events in the country get a lot of positive international coverage that uplifts the country image, which is very vital from a national level. YouTube, the video-sharing website was blocked across Pakistan following orders of Prime Minister Raja Pervez Ashraf back in September, 2012. Under pressure from religious parties on the blasphemous film uploaded on YouTube, the PM issued instructions to the Ministry of Information Technology to block access to entire YouTube throughout the country. Unfortunately, this issue remained unresolved for more than 3.5 years as the Ministry was unable to reach any understanding with Google to block blasphemous content on YouTube. Finally, this year the Ministry and PTA were able to convince and come up with an understanding with Google to launch the local version of YouTube with .pk domain for Pakistan. Unblocking YouTube after such a long time is still a very good initiative taken by the MOITT as some of the services being offered by the content providers are based on the YouTube engine in addition educationists, researchers and consumers who will benefit from the useful content available. 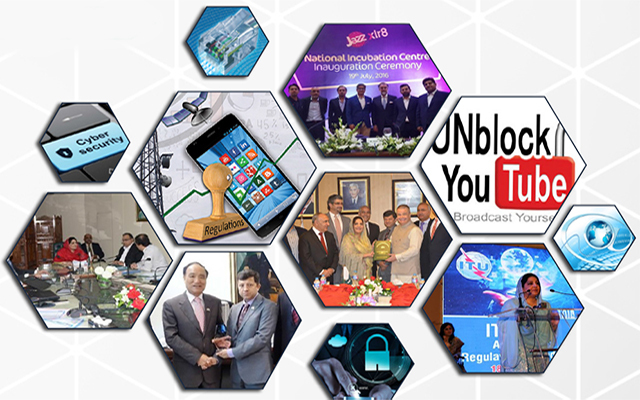 Establishment of National Incubation Center: The Ministry of IT also collaborated with ICT R&D Fund to establish its first National Incubation and Acceleration Center in association with Mobilink. The center has been developed to further the Government’s vision of a digital Pakistan. The center will nurture talent from across Pakistan under the Mobilink sponsored ‘Jazz XLR8 Program’. The program shall help in showcasing how to bridge the gap between Entrepreneurs, Innovators and Investors, while providing state-of-the-art incubation facilities and access to experts and advisors. This is a very good step that the Incubation Centre being set-up will be run under the patronage of both MoITT and Mobilink. Pakistan as a country with approximately 25K-30K IT Professional graduating each year will need such centers in hundreds if not thousands and that too in more cities than main three cities of Karachi, Lahore and Islamabad. Such efforts will no doubt set example for rest of the mobile companies and they would also play their roles in establishment of such technology incubation centers. A major short coming of the present government and MoITT is its failure to introduce an IT policy while one expected it to be a part of the overall converged ICT Policy (in some countries even broadcasting is part of the ICT Policy); this is not the case in Pakistan. The lack of an IT policy could be detrimental to the well-being of the IT sector- that has its entire technology asset based on local resource. From the mishandling of blocking and subsequent unblocking of YouTube and to larger issues that Pakistan has not been able to make it mark in the IT Sector despite its capability is primarily because of the absence of a comprehensive IT Policy. This would not have happened if an IT policy was in place addressing all issues relating to the branding, Software Export Potential, Human Resource Development, Infrastructure and handling of websites and the censorship of content suitable for Pakistani audience. It is given on the MoITT web site that Ministry of Information Technology has formally started consultative process on IT Policy frame-work in order to get inputs from all stakeholders. In the first phase, they have planned consultations with the industry which they have indicated that it has already been concluded and in the second phase, the ministry has solicited input from academia. It is very important that the MOITT completes and announces the IT Policy that is generally the primary task of the ministry and should have been done quite some time back. ICT has become an important part for every nation and countries are leading themselves to become best in this field in order to achieve higher standards of living through technological interventions. IT Parks play a crucial role in the development of this sector. But IT Parks, aside from serving the purpose of technological advancement, aim to bring up the economic standard of the country. Through Foreign investments and infrastructure build- ups, development of IT Parks are a source for creating job opportunities for the domestic people and therefore are essential for a nation’s economy. Unfortunately, the development of IT parks has always been on the back burner that needed practical steps to be achieved at an accelerated pace. This year while budget has finally been allocated but it is yet to be seen if Ministry will be able to make any practical steps in realizing this dream. One positive development in this regard is the collaboration of MoITT with Exim Bank Korea. The bank was engaged and has developed a feasibility report for the IT Park which is proposed to be built in Chak Shahzad Islamabad. Also the ministry plans to replicate this progress in Lahore and Karachi. Although the signs indicate a step towards the right path, let’s hope that the budget allocated this year is put to use within this fiscal year and we are able to see the actual signs of development in due time. With shifting trends in technology the Government sector also needs upgradations to keep up with the fast paced changes. E-government and innovation can provide significant opportunities to transform public administration into an instrument of sustainable development. Through e-government innovation, public administrations around the world are becoming more efficient and effective respond to demands for transparency and accountability. But unfortunately our Ministry is still unable to recognize its potential which indicates its ineffective approach towards the most important sector of Pakistan. One such example includes the establishment of National Information Technology Board (NITB). Unfortunately, NITB has offered nothing new since its establishment besides a name change from Pakistan Computer Bureau (PCB) and E-Government Directorate (EDG) which were preferably dissolved to create NITB expecting to increase Pakistan’s virtual presence. Nothing worthwhile has been achieved by the NITB which the organization could proudly share with the readers. As “Hope is the thing with feathers” and it enables one to keep on believing so we will keep our fingers crossed and wait for the outcomes and efficiency of the National Information Technology Board. Not only in the last 3 years but probably now for over 8 years we kept hearing on media with MoITT informing everyone that in the TIP board meetings the Ministry is committed to revitalize TIP as soon as possible and that it is working on it. Going through the record available on public domain even as close as in 2014, during 179th board meeting of TIP, no less than the Minister directed the TIP management to prepare a complete revitalization plan for TIP and submit in the next board meeting and this plan probably never came through as we saw in 2016 during 184th board meeting, the Minister asking for the same plan on deteriorating status of TIP and how to bring it back on its feet. Unfortunately, we haven’t seen any good news on this and the worst part is that time is not on TIP side as its situation has decline beyond repair. The overall performance of MoITT this year has improved as it was able to achieve many significant milestones that will have a positive impact on the Telecom and IT sector of Pakistan. However, there is always room for improvements and the opportunities are unlimited. We expect that next year the IT Ministry will be able manage and achieve the remaining milestones and target it missed out this year. 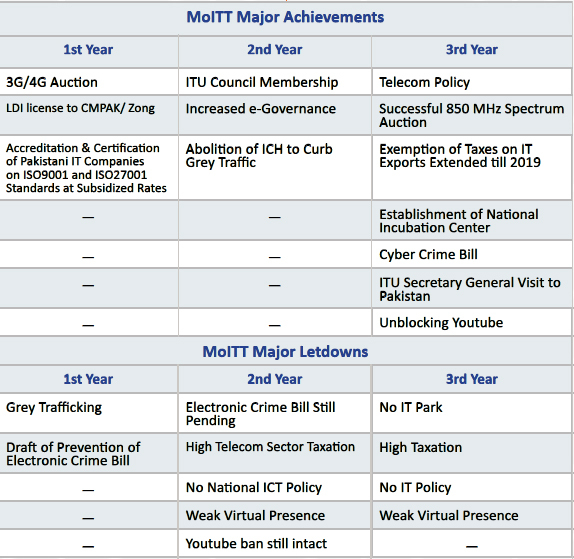 Overall performance of MoITT this year has improved as it was able to achieve many significant milestones that will have a positive impact on the Telecom and IT sector of Pakistan.